large mirror on the vanity wall, which we will keep, everything else must go. In the original floor plan, the large jacuzzi tub took up a lot of space leaving little room for the shower. Due to the window that is also on the same wall, there was little space to increase the shower size in the new design. After some thought, we decided to remove the jacuzzi tub and expand the shower the entire length of the wall; this would give us the walk-in shower we were looking for. Currently, when you enter the bathroom there are two small double doors that open into the room. Behind those doors is the linen closet door, then there is another door for the private water closet... whoa!... Let's simplify this a little...here is the plan, remove the two double doors entering the bathroom and replace it with a pocket door. Pocket doors are a great space-saving option when space is limited. Sliding barn doors seem to be the current trend and are a great alternative design that can be used to create a unique look. For this project I opted not to do the sliding barn doors; I have plans to use them for another project. Here is the original floor and the new floor plan. 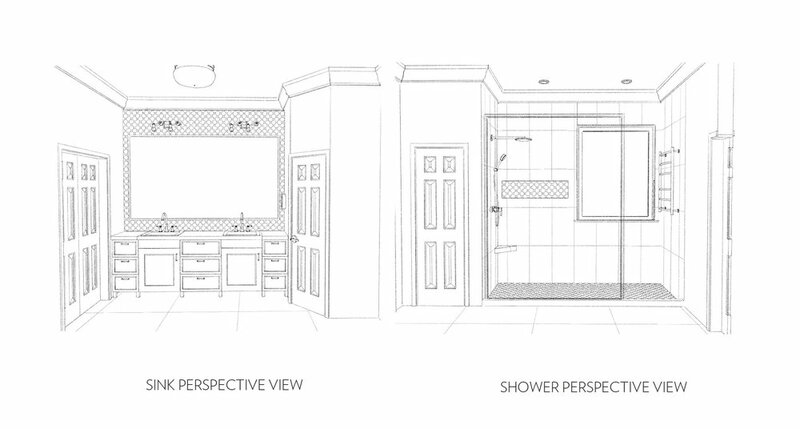 In the new floor plan, the walk-in shower will have 12"x24" porcelain tile that will run vertically on the wall, wrap inside the window and extend on either side of the shower wall. Matte black shower fixtures will be used along with a brushed stainless linear drain and towel warmer. Glass panel will run 3/4 the length of the shower; leaving an opening for entering and exiting the shower. The walls that are not tiled will be painted a satin finish and we'll keep the existing crown molding. For the sink wall, we'll replace the vanity with a white shaker-style design. The backsplash will cover the entire wall with matte black light fixtures above each sink. A small makeup mirror will be hardwired on the wall for minimal clutter on the countertop. The countertops will be quartz in a honed finish with matte black faucets; this will give a nice contrast to this simple design. After all that planning, it's finally time to execute the design. First, let's finalize the color pallet. The master bedroom was updated last year so I wanted to incorporate those colors into the bathroom design. I plan on using white, off-white and cement gray. The fixtures will be matte black and brushed stainless, creating a modern yet timeless design.